Bamboo is not as hard to control as some people apparently think. Here's an answer I gave to the question in a past column. Answer: Bet I can! There's a forest of bamboo in the creek area behind my house. It aggressively tries to advance into the yard every year, so I have to stop the advance. The first step is to knock the shoots down in the spring. As you know, they grow very fast, so this work has to be done daily. Kick them over or slash them off with a machete, which is highly satisfying. Then use a sharpshooter shovel or a hoe to probe the soil and find the underground stems (rhizomes) that the shoots grew from. Trace the rhizomes back toward the plants that will be left and use the sharpshooter or other tool to sever the runners every couple of feet. They do not have to be dug out of the ground. I have killed large areas of bamboo with this technique. Without top growth, cut runners will die. If you wish the bamboo to be completely gone, cut the top growth to the ground now and use the same procedure explained above over the entire growth area. This works because bamboo doesn't grow back well from the rhizomes when the runners are severed and there is no top growth. In case you are wondering, herbicides do not work at all. Goats are also a possible solution. 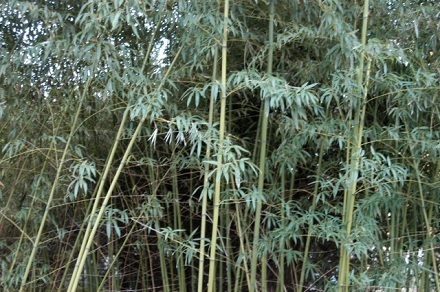 Yes, I think goats would love to eat the bamboo, especially as the young shoots emerge in the spring. Only problem is they would most likely wipe it out completely, so don't use them unless eradication is the goal.